Did you ever watch old western movies, or the classic ‘60’s TV serial, “The Lone Ranger”, when you were a kid? Think back to those iconic images. The posse, or the Lone Ranger and Tonto, are ambushed by the bad guys. The evildoers have a protected vantage point on top of a pile of rocks that provide them cover. The heroes are pinned down around the bottom of another big group of boulders. You can see snow-capped mountains in the distance. The hero sneaks around the jumbled landscape, dealing with a deadly rattlesnake along the way, while his sidekick keeps the killers occupied and provides a cover of ricocheting bullets. Our hero surprises the bandits, usually wounding one in the leg or his shooting arm, and captures them alive, taking them back to town, to sit in jail until their trial. Justice is served and the hero saves the day. If you’re anything like me, those wild desert scenes may have sparked your imagination, making you yearn to travel through the Wild West and play on those crazy rocks. Well, you still can! Visit the Alabama Hills. This area’s iconic landscape was featured in hundreds of old westerns. Classic films like How the West Was Won and Humphrey Bogart’s Treasure of the Sierra Madre were filmed here. It’s still a choice location for movies, TV shows, and commercials today. More recent films shot on location here include Iron Man, a couple of Star Trek movies, and the more modern version of The Lone Ranger. Situated just west of Lone Pine, California, on the road to Mt. 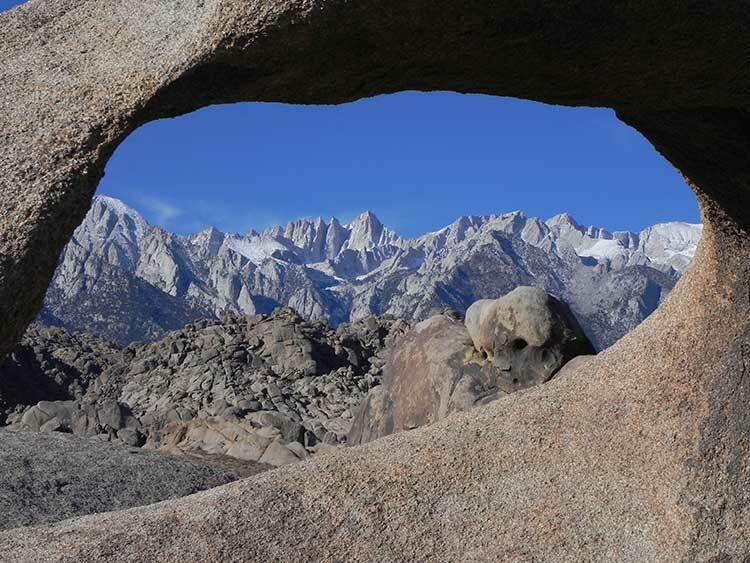 Whitney, the Alabama Hills showcase some of the most spectacular scenery in California. Rounded, rusty, grainy rocks litter the landscape. It looks like the Jolly Green Giant dumped a sack of potatoes. One lonely cottonwood tree provides a spot of color in the midst of the mounds, its leaves changing from green to gold. In the backdrop, you see the Sierra Nevada – gray, stark angular mountains, vertical topography going straight up, up, up…all the way up to Mt. Whitney, the tallest mountain in the contiguous United States. The area is part of the Basin and Range geologically. An active fault separates the Alabama Hills from the Owens Valley. In fact, one of the biggest earthquakes in California history, estimated to be about 8 on the Richter scale, took place on this fault. On March 26, 1872 the earthquake destroyed the town of Lone Pine, demolishing 52 out of 59 houses and killing 23 people. The mountains moved, uplifting 15-20 feet and moving 35-40 feet horizontally. The Alabama Hills are a mountain range buried in its own waste. It's estimated that the Owens Valley is packed with about 10,000 feet of fill, deepest just east of the Hills at Lone Pine. The entire escarpment was buried when the region hosted a much moister climate. Gravity surveys show that the rocks we see above ground now are just the tips of a very steep escarpment. The rock of the Alabama Hills is the same age and chemical composition as the Sierra Nevada. It’s hard to believe those lumpy potato rocks share the same origin as the sheer cliffs behind them. Different erosion processes create their very different appearances. The Sierras are sculpted by ice. Glaciers carved through the mountains 10,000 years ago. Ice and water continue to shape these mountains today. Water finds its way into cracks; freezing, thawing, freezing again until it splits the rock along those weaknesses, like a woodcutter splitting a piece of kindling. This is fresh, unweathered rock. 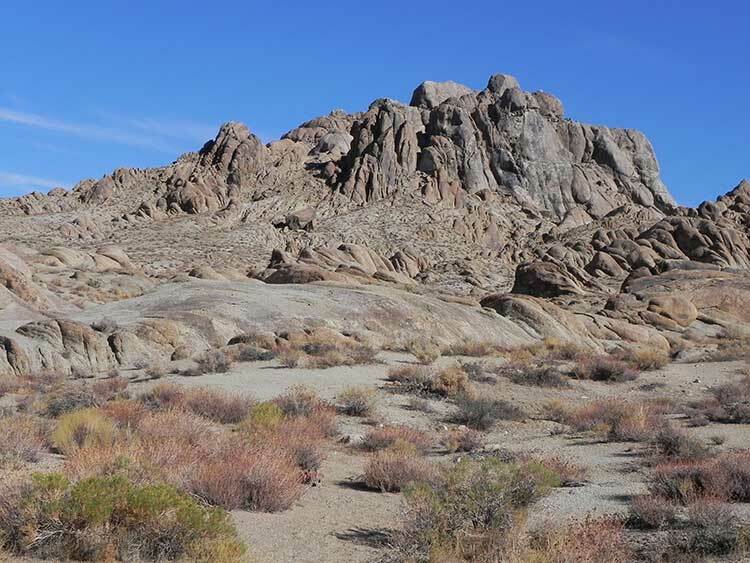 Burial under a moist region covered with vegetation molded the rock of the Alabama Hills differently. It deteriorated, exfoliating through a process known as spheroidal weathering. It sheds its skin one thin layer at a time, peeling like an onion. The rock changes slowly, but the persistence of wind and water carve the boulders into fantastical shapes. It's a land filled with graceful arches, providing picture frames through which to view the dramatic panorama behind. The landscape is dominated by rock, but if you look a little closer, you’ll see there’s much more here. In springtime, the Alabama Hills host an astounding array of Mojave Desert wildflowers. Look for carpets of wooly daisies and purple mat. Mojave asters fill the flat lands along Movie Flat Road. Chia and scarlet locoweed cluster near the rocks. The Alabama Hills are home to an interesting array of animals, too. Snakes and lizards abound. Here you’ll find coyotes, kit foxes, jackrabbits, woodrats, even ringtails. One night I was highly entertained by a kangaroo rat creeping around my campsite, undeterred by my red-lighted headlamp. It’s over 200 miles to Vegas, and LA is on the other side of the Sierra, so this is a great place for stargazing, far from the lights of any big cities. Time it right and you can see the moon set behind the Sierras as the sun rises in the east. 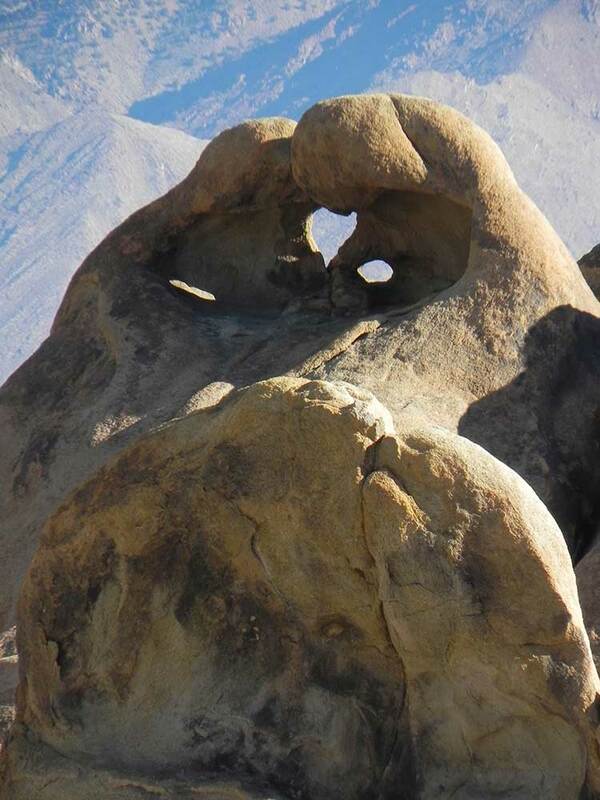 The Alabama Hills are a lot like the rocks of Joshua Tree National Park. This means they are an incredible place to do a little rock climbing or bouldering. This is also an excellent area for mountain biking, as the hills are crisscrossed by an abundance of roads. There's a short trail along Movie Flat Road that will take you to the famous Mobius Arch. It’s an easy walk and only takes about ten minutes. The roads into the recreation site are graded dirt, but they are not graded very often. The washboarding can be horrendous at times. Many of the side roads are very sandy. Unless you're traveling in a high clearance SUV or truck, use caution so you don’t get stuck or do damage to your vehicle. One of the best things about the Alabama Hills is access to free dispersed camping. Many of the roads leading to different rock formations also lead to excellent camp spots. A lot of these spots look quite intriguing, but since this is a popular area, you'll need luck and good timing to find the choicest spots unoccupied. I always seem to end up in the same camp spot, a little closer to Movie Flat Road than I would prefer. It’s okay though, as I’m usually just there for an overnight. I only have to roll out of my sleeping bag to get an amazing view of the sunrise alpenglow on Mt. Whitney and Lone Pine Peak, so I like it just fine. Since this is a fairly high use area, please practice strict Leave No Trace principles. Use existing campsites and don’t create new ones. Pack out everything you bring in. I do mean everything. Because so many people use the area, burial isn’t a good idea. Carry a wag bag or a groover if you are not in a self contained RV, or camp in a nearby campground with an outhouse. During the winter months, many of the campgrounds are free. 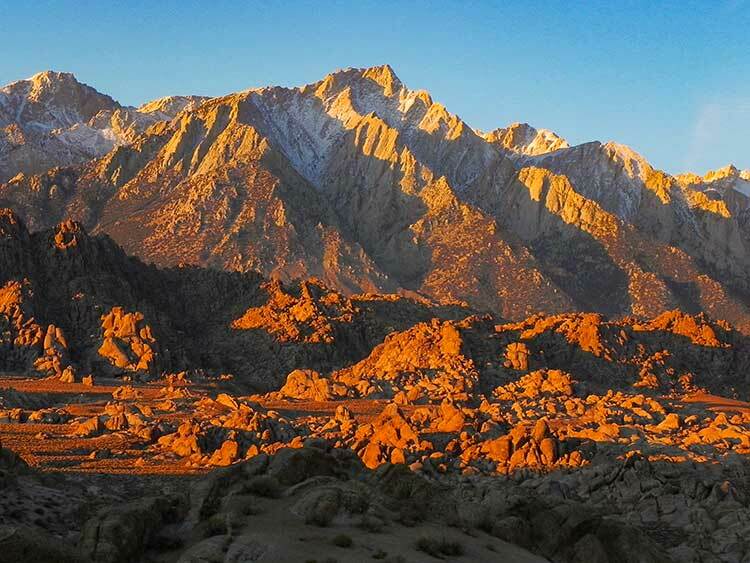 Check with the multi-agency Visitor Center just south of Lone Pine for a list of campgrounds. For a place that nearly everyone has seen on the silver screen, surprisingly few people even know that the Alabama Hills exist. Come on out, play awhile and you can be a star in your own movie!